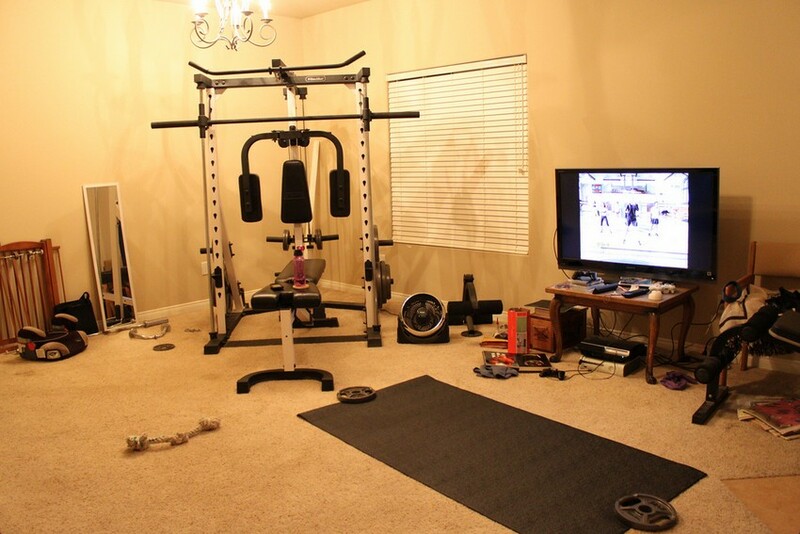 Building a home gym is one of the most exciting things for any athlete. You get to design your own personal workout space and choose whatever equipment you want to workout with. The only downside is that fitness equipment can get pretty costly, and a lot of us are always looking to get the best value for our dollar to stay within our budget. One piece of equipment that you can save a lot of money on is a bench press. Because bench presses are pretty simple in design, you don’t need to spend a fortune just to get a solid product. There are a lot of cheap bench press options that give you the functionality you’re looking for without putting a major dent in your wallet. I decided to do some digging around online because I wanted to see which brands offered the best cheap bench press. After comparing over 20 different models and looking at things like quality, durability, customer reviews, and of course price, I’ve narrowed it down to 3 great choices that are all below $175 and pack some serious value for your dollar. After countless hours of researching and comparing models, I chose the Marcy Diamond Olympic Bench as the #1 best cheap weight bench. This was the most well-rounded model in terms of quality, durability, and price, offering an extremely solid product for a very reasonable price. Not only that, but it also has several bonus features built-in for more workout options, as well as the #1 highest customer review rating out of any other model in this price category. For those who aren’t aware, let me start by saying that Marcy is one of the biggest producers of home gym equipment in the world. They’re well-known for designing high-quality equipment and they’ve built a very solid reputation in the fitness industry since their foundation in 1959. Anyhow, now that you’ve got a little background on Marcy, let’s talk about their MD-879 Diamond model bench press. No matter what type of product you’re looking for, if you’re trying to find something in the “cheap” price category, the first concern is usually the quality. As we’ve all learned by now, a cheap price usually equals a cheap product. Thankfully, the Marcy Diamond bench press proves that is not always true. Although it’s on the cheaper side, the MD-879 bench is every bit top-notch-quality that you’d expect from a world-leader like Marcy. Rated to hold a massive 600 lbs, this is the strongest bench press in the sub-$200 price category. The entire frame of the bench is built with heavy-duty steel, and the barbell is held using beefy 3-inch round steel crutches (which are adjustable so that you can find the perfect bar height for yourself). The quality and strength of the frame are two aspects that cannot be taken lightly when it comes to a bench press, so this model’s superior build is quite impressive considering the low price. The bench itself is made with a durable leather-like vinyl that’s padded nicely and makes for comfortable seating, but what’s more important than that is the fact that it’s extremely sturdy. The last thing you want is for a bench to move around on you when you’ve got a heavy barbell pressed above your body. 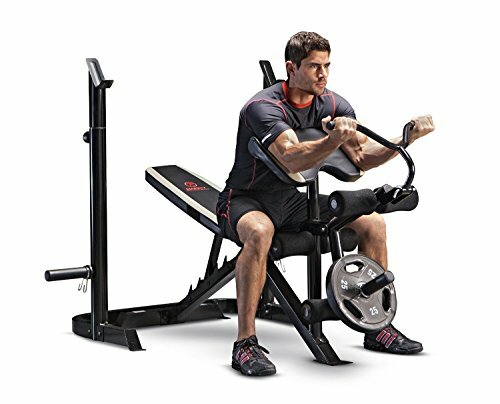 It’s also adjustable in 5 different positions (decline, flat, two inclines, and military), which is nice so that you can work the chest from all angles plus the military position for building strong shoulders. Something unique about the Marcy Diamond bench press that really makes it stand out is the 2-piece design. Rather than being combined into one single structure, the bench and the weight rack are two separate pieces that can be used together or separately on their own. Why is this a good thing? For starters, it opens up the ability to use the weight rack as a squat rack. Simply pull the bench away from the weight rack, raise the crutches to shoulder height, and you’re ready to go. It also gives you the ability to pull the bench out and use it on its own for a wide variety of other exercises instead of being restricted to only chest movements like you would be on any other standard bench press. In addition to the separated design, the Marcy press also has a few extra features built-in to give you even more workout variety. Attached to the front of the bench is a full preacher curl setup with a removable curl bar for isolated arm workouts, and just below that is an attachment that Marcy calls, “the total leg developer,” which allows you to workout your quads, hamstrings, and glutes. Overall, the Marcy MD-879 Diamond bench was the #1 best cheap bench press out of 20+ different models I compared. Not only was it the highest build quality with the strongest frame, but its 2-piece design and extra built-in features offer a nice variety of additional workout options that make this model the best value for your dollar by far. I spent a good 20 minutes or so digging around online to see which website had the best price, and the cheapest place to buy the MD-879 is on Amazon. Some other online stores also have it listed for a similar price, but Amazon also gives you free shipping which saves you another $$, so I suggest buying it there if you want the best deal. The Body Champ Olympic Weight Bench was a close #2 runner-up to the Marcy MD-879 bench. While both of these models are very similar in features and price, the Marcy had a slight advantage over the Body Champ model because it was a little nicer quality and also offered more workout variety thanks to the unique 2-piece design, so that’s why it took the top spot. Other than that, the Body Champ bench is still an awesome choice. If for whatever reason you were not impressed with Marcy’s bench, I’ll give you a brief review of Body Champ’s bench below. 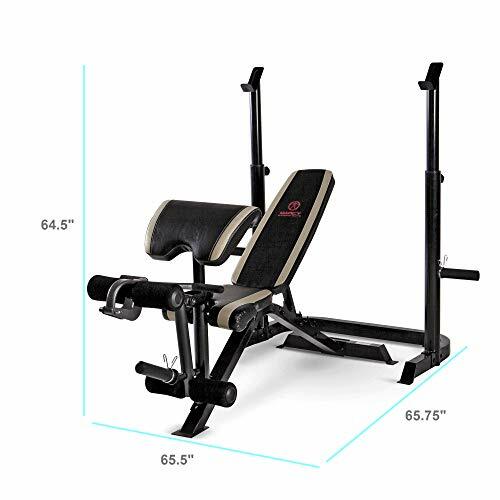 The Body Champ Olympic bench press is built using 2.5-inch heavy-duty steel tubing all the way around to ensure a strong frame that’s capable of holding a lot of weight (unfortunately there is no specific strength rating from Body Champ, but customers have reported using over 300 lbs without any trouble at all). Since the design is one complete piece, the bench is very sturdy and there are no worries about something moving around on you while you’re lifting. As far as quality goes, the Body Champ bench gets the job done. It’s not quite on Marcy’s level quality, but the leather is durable and the only real complaint I have about it is that it’s a little plain-looking (but that’s just my inner love for detail and design speaking out). 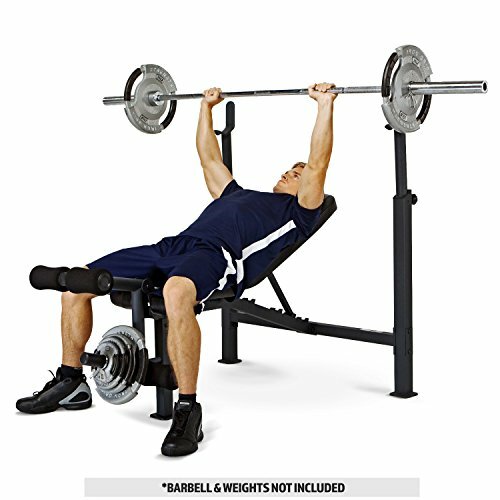 From what other users say, the bench is pretty comfortable even for taller people, which can sometimes be a challenge when you’re finding a cheap bench press – or any bench press, for that matter. 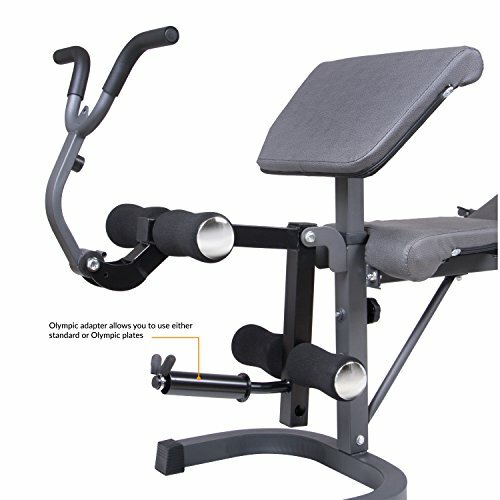 It’s also adjustable for decline, flat, incline, and military press positions. While it doesn’t come with squat capability because the design is only one piece, Body Champ does include all of the same extra features as Marcy’s MD-879 bench. 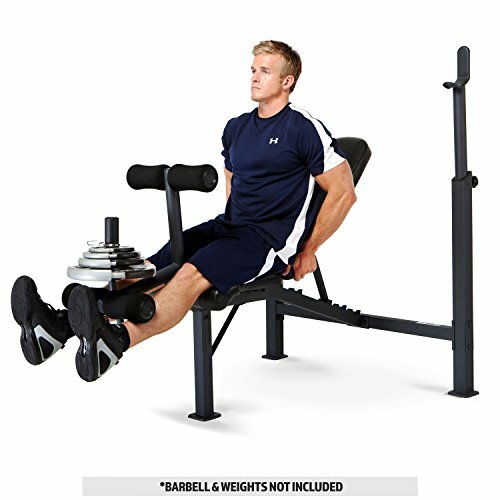 There is a preacher curl attachment built into the front of Body Champ’s bench to allow arm workouts, and below that is a leg developer to work the major muscles on your legs. There’s even a crunch handle attachment for weighted ab exercises as well. As I said above, I think the Body Champ model is an excellent alternative to the MD-879 Marcy model if you’re looking for a nice cheap bench press. It’s built tough and offers nearly all the same features (with the exception of the 2-piece design), plus it comes at an equally low price. It also happens to be the #1 best-selling bench press on Amazon, so that right there tells you how much people love it. To read more customer reviews and see real user images of this setup in action, check out the Body Champ listing on Amazon. Last but not least, the #3 spot for best cheap bench press goes to the Competitor Olympic Bench from Impex Fitness. While it’s not as feature-packed as the other 2 models in this list, the Competitor bench is another good alternative if you’re looking for a press that’s functional and affordable. I do have to be honest though, this model is lacking a bit in the strength department, so I’d really only recommend going with this bench if the Marcy and the Body Champ models are unavailable. Let me give you a brief overview below so you know what I mean. Like Body Champ’s design, the Competitor bench press is built using 2.5-inch steel tubing which provides a nice framework for the structure. However, it only has a single cross-brace between each side of the weight rack, and the bar catches are a bit more slim than usual. While these aren’t necessarily major issues, these two details cause the weight rack’s posts to flex a little when you’re setting the weight on the rack, which can obviously present some strength concerns so I wanted you to be completely aware before buying. It’s still capable of holding a massive amount of weight and a lot of people report the flexing is nothing to worry about, but for me personally, the flexing of the weight rack would make me a little uneasy. The weight bench on the Competitor press is actually really nicely done. On the outside is your typical leather-like vinyl, but underneath is a 2-inch thick layer of foam padding that provides comfortable seating during your workouts. Unfortunately, there is another strength concern to bring up here. The bench is adjustable in several positions (which is good), but the bar used to secure the bench in place is plastic. As we all know, plastic is weaker than steel, so that’s just something to mention in case strength is hot button for you like it is for me. This is another reason I recommend the other two models in this list; they use entirely steel framework. When it comes to features, the Competitor press is more on the basic side, which isn’t necessarily a bad thing by any means. 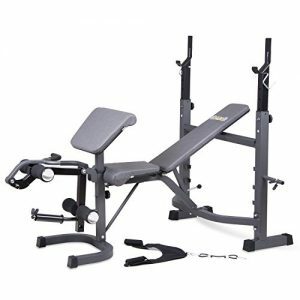 It comes with your standard bench press options like decline, incline, flat, and military press, and the only extra attachment is a leg station. The foam pads on the leg station are contoured to fit the natural shape of the leg which adds some extra comfort there too. Overall, the Competitor model from Impex Fitness is a good cheap bench press for regular home use. You’re getting what you pay for here, which in this case is a comfortable and reliable press station. If for some reason you really hated both Marcy’s and Body Champ’s bench press models, the Competitor should do a perfectly fine job. Just be aware of the strength issues I brought up above. You can always read through other customer reviews on Amazon to see what other people thought about this model as well. The most obvious thing to consider before you buy is space! Bench presses are by no means a small piece of equipment, so you want to make sure you’ve physically got enough space to fit the bench before you pull the trigger and make the purchase. My best piece of advice is to pick an area where you want to put it and actually measure the dimensions of this area. Then, check the dimensions of the bench you’re thinking about buying. Is it going to fit? If so, awesome! Nothing to worry about here. If not, you have two options. The first option is to see if there’s anything you can do to free up more space in your workout area. This is usually the easiest thing to do. However, if you’re really limited by space and have no extra room, your only other option is to find another cheap bench press that has a smaller footprint and will fit in the space you have available. If you’re not totally set on a bench press and you’re open to other ideas, you can also find a good compact home gym to accommodate your size and space restrictions. The quality and durability of the press you’re interested should definitely be on your list of things to consider. Benching is one of the three biggest compound exercise movements, meaning your new piece of equipment better be well-made and strong enough to handle that kind of weight resting on it. The last thing you want is to set the weight on the rack and have something split or come loose. 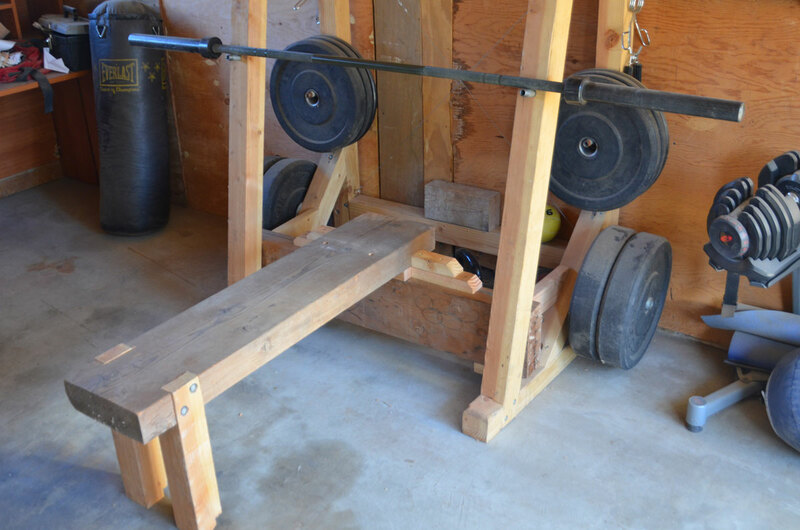 People often associate the word ‘cheap’ with low-quality, but remember what I said in the introduction to this article: just because you’re looking for a cheap bench press doesn’t mean it has to be low quality. Bench presses are fairly simple products, and there are plenty of nicely made presses that can handle tons of weight without having a massive price tag. If you’re considering purchasing one of the 4 options I highlighted above, you know what each of those are capable of because you read my reviews. However, if you’re considering a different model that’s not listed, just make sure you’ve looked at all of the strength ratings and taken the time to read customer reviews to see what other people think about the model you’re interested in. 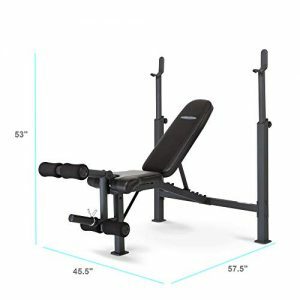 If you’re looking for a cheap bench press, you already know that cost is an important variable in finding home gym equipment. However, with that being said, that doesn’t mean you should go right for the cheapest option available. As I said above, you still need to consider the crucial aspects like quality and durability to ensure you’re buying a solid product. Each of the options on this list are already pretty cheap, right around the $150 range. Sure, you could probably find some super cheap bench press online for $100 or less, but is the hazard of something breaking really worth that $50 in savings to you? I don’t know about you, but I’d rather spend the little bit of extra cash to ensure I’m getting something well-built that’s going to last me for years. One less-obvious consideration to make is which type of bench press you’re looking for. Each of the above 4 presses are adjustable (which is what most of us want so that we can hit flat, incline, and decline), but is there any other functionality you’d like? Just because it’s a cheap bench press doesn’t mean you have to settle for some basic product. Presses have become pretty versatile nowadays, offering add-on features like preacher curl attachments, cable attachments, and a few other functions that allow you to get more than just a press movement out of your new bench. 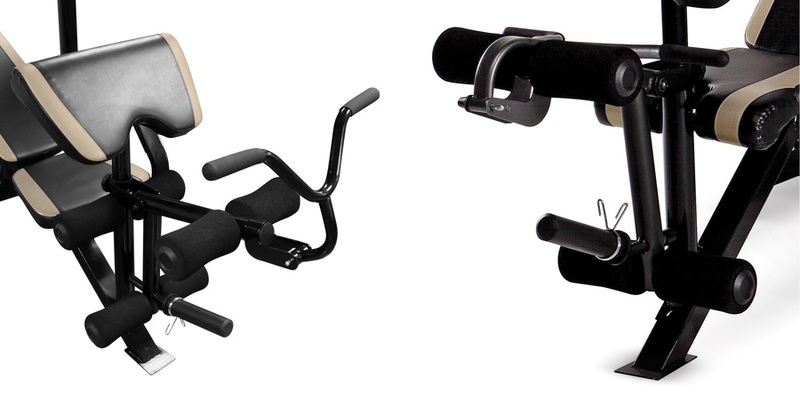 Like I said, I’m sure most of us just want it to be adjustable, but remember that this is going in your home gym so you’re probably going to want to efficiently use the limited space you’re working with. If you can get a cheap bench press that offers a few other workout functions, it might be well worth it to you (especially if they’re all around the same cost anyways). A lot of people tend to overlook warranty when they’re comparing different models, but I think this is a good aspect to consider if you’re looking at things in the long run especially when you’re looking for a cheap bench press. Bench presses are a pretty simple product by design, so it’s rare that you’d ever experience an issue with one. However, if that day ever comes around, you want to be sure you’re covered. When you’re looking at different models, check to see what each product is offering for warranty coverage. You may just end up choosing one or the other based on how long the press is covered for. While a bench press can do a lot, it can’t do everything. You need the best home gym equipment to go with your bench press to get the best workout within your own four walls. Buying the best cheap bench press probably isn’t going to do you any good if you don’t have a barbell and a set of weights to lift with. 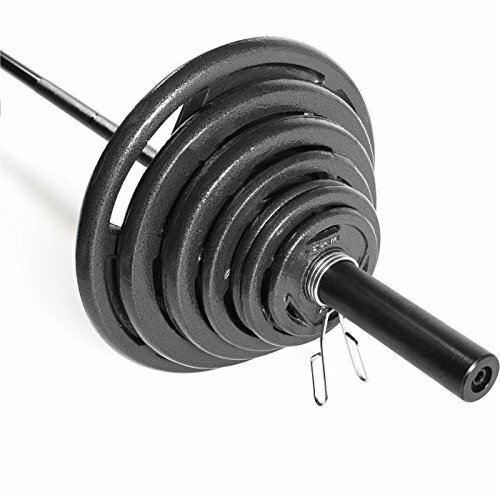 If you’re looking for something quality but cheap, the 300-lb Olympic Weight Set from CAP Barbell is by far the best value for your dollar when it comes to weights. This package includes a 7-foot standard Olympic barbell, 300 pounds of weight plates, and spring collars to hold the weights onto the barbell for safety. Not only are these weights really nicely made, but this is the only 300-lb weight set package that’s available below $300. Depending on where your new cheap bench press is being setup, you may need some good home gym flooring to protect your floors so that they don’t get scratched up or damaged. If you’re trying to stay on the cheap side here, a pair of interlocking foam tiles should do the trick nicely. Check out our buyer’s guide for home gym flooring to see which type of floor material you like best. Bench presses are an essential piece of equipment for any semi-serious weightlifter, so hopefully this buyer’s guide points you in the right direction for finding a solid cheap bench press. Usually when you’re shopping for things in the “cheap” category, it’s hard to find something that’s nice quality and will last. That’s why I was extremely careful in my research when comparing models. I wanted to find the nicest quality at the lowest price, and I’m happy to say that’s exactly what I ended up with. The three I’ve listed above, especially the #1 and #2 choices, should serve you extremely well in your weightlifting for many years to come!